AVID, Advancement Via Individual Determination, is a schoolwide college and career readiness system. 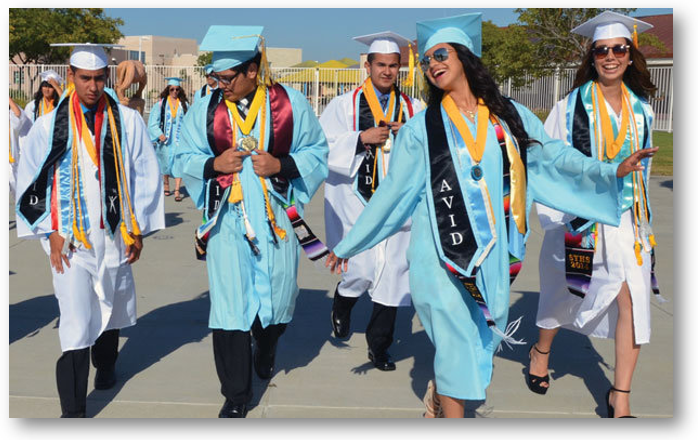 AVID is designed to increase the number of students who enroll and succeed in higher education and in their lives beyond high school. The AVID College Readiness System is the only elementary through higher education instructional system (K–16), which allows for regional alignment that strengthens student potential for completion. AVID-trained educators teach students academic and social skills to help them develop the habits and behaviors needed to succeed in rigorous curriculum. The AVID College Readiness System is a catalyst for developing a school culture that closes the achievement, expectation, and opportunity gaps many students face, and it prepares all students for success in a global society. AVID aligns a school campus with the most current research-based college and career readiness practices. At the elementary level, AVID instructional practices are used schoolwide. At the secondary level, AVID instructional practices are used schoolwide and the AVID Elective class is utilized to add an extra layer of support for college readiness if a student chooses to participate. In addition, AVID professional learning and resources help teachers improve student performance by embedding best teaching practices, encouraging self-advocacy, providing support, and building relationships that encourage high levels of student engagement. AVID is a leader in professional learning, training more than 25,000 educators each year. In Mesa, over 35% of all educators have received formal training in AVID instructional practices, while all Mesa teachers have received at least some level of training in AVID instructional practices. AVID Seniors, please report your financial aid awards here! Explore www.avid.org to learn more! Apply to be in AVID! See how AVID aligns with most other district initiatives.